I HAD A PHONE CALL LAST NIGHT..
A WOMAN- GRANDMOTHER TYPE- HAS GRANDCHILD WITH SOME LONG NAMED PROBLEM- 8 YEARS OLD--STORY WENT ON WITH WORDS LIKE REHAB, SAINT JUDE , MANY MONTHS... I LOST TRACK.. SHE HAD .HEARD/SAW TEH BELLA STORY... WANTED TO GET HER CHILD INTO THE PROGRAM AND VERY GINGERLY STARTED TO SAY " I KNOW THESE DOGS COST ALOT" SO I SAID STOP RIGHT THERE- WE DONATE OUR DOGS-- SHE STARTED TO CRY- THAT TOOK A WHILE, AND IT GAVE ME A CHANCE TO EXPLAIN THE "WE" WERE THOUSANDS OF CAMERA PEOPLE WHO DONATE FROM $10,000 ALL THE WAY TO 44 CENTS FOR THE STAMP TO SEND LETTERS APOLOGIZING FOR NOT BEING ABLE TO SEND MONEY BUT WANT TO ENCOURAGE US. EVERY ONE IS CRITICAL IN THAT SCHEME ! 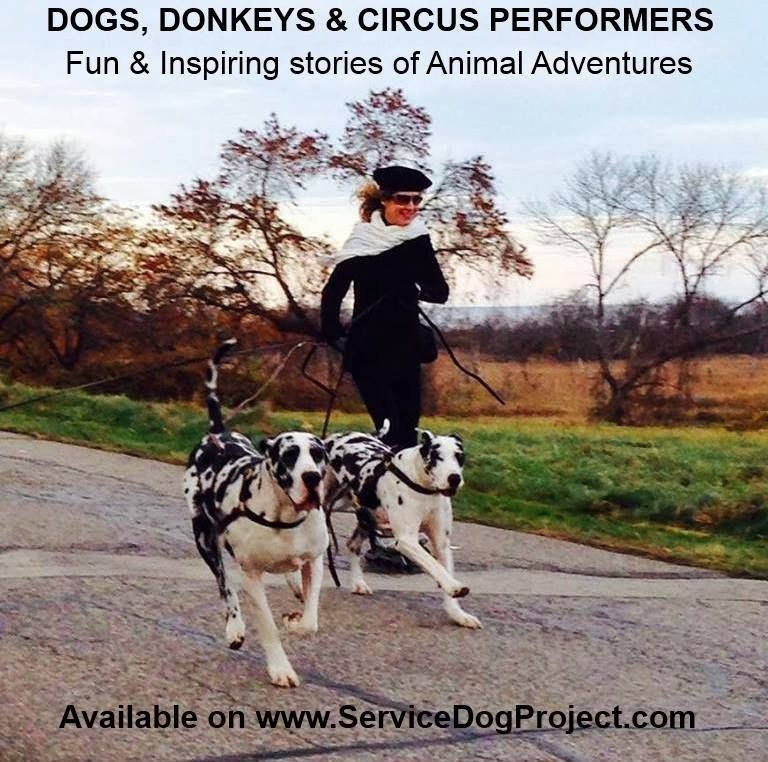 ------ THERE IS A SCENERIO WHERE THE WOMAN MIGHT CALL ANOTHER SERV DOG OUTFIT -- ONE THAT IS NOT SO LUCKY TO HAve the support we do from so many...-- one that has to charge for their dogs... the woman might have been told " go find the $20,000 somewhere." in which case she would have taken a second or third job and felt guilty about spending $1.00 anywhere for teh next 2 years in hopes that her grandson would quALIFY FOR A DOG IF HE HAD TEH $20K. WE FINALLY GOT TO HOW TO APPLY... AND I WENT THRU---GO READ OUR THE WEB SITE-- LOOK FOR "INQUIRY" AND SEND US INFORMATION. I ASKED IF EITHER OF THE CHILD'S PARENTS WERE VETERANS OR FIRST RESPONDERS- AND SHE SAID " NO HE WORKS HARD BUT IS ONLY A CONCRETE WORKER" -- WHICH SET ME OFF ON THAT TIRADE.. IT WAS TEH "ONLY" THAT GOT ME. THERE ARE TIMES IN MY LIFE WHEN I HAVE BEEN VERY FORTUNATE TO KNOW A CONCRETE WORKER..... WHERE IS TEH TIPPING PONT THAT MAKES YOU AN "ONLY?" .....TEHRE ARE TIMES WHEN I HAVE BEEN AN "ONLY".... MOST NOTABLEY -- MY FAVORITE... " I WON'T GIVE YOU A BUILDING PERMIT -- YOU ARE OUT OF YOUR LEAGUE. YOU ARE ONLY A WOMAN" OR A FAMILY FAVORITE "SHE IS ONLY A DOG TRAINER"
A QUICK TRANSITION TO ARGUING WITH GEORGE ( DVM)-- THERE ARE TIMES I HAVE AGREEED WITH HIM-- NOT OFTEN. BUT A FEW.... YESTERDAY IT WAS TEH SOMETIMES OVERBEARING RESPONSIBILITIES OF DOG OWNERSHIP WHICH PREVENTED MANY KIDS TODAY FROM LEARNING TEH POSITIVE THINGS OF OWNING A PET. TEH DETAILS OF THAT ARGUEMENT WOULS TAKE 6 DAILY DOGGIES EVEN IF I DIDN'T LET HIM CONTRIBUTE.... BUT HIS FINAL PITCH WAS "THE PITCHFORKS ARE COMING"
TURNS OUT THAT "THE PITCHFORKS" IS A TED LECTURE. IT IS NOT A POLITICAL DISCOURSE ... BUT A PURE ECONOMIC ONE.. IN MY OPINION.. BUT WHAT DO I KNOW.... I AM ONLY A PITCHFORK. SOMETIMES I CAN'T SEND THE LINK IN WHICH CASE---GOOGLE IT.